You will earn 9.44 Reward Points. Earn 1 reward point for every 1 dollar spent. Portion Control - Available in nine sizes (6, 8, 10, 12, 16, 20, 24, 30 and 40) to provide exact portion control. Dependability - Model 78 Disher is considered the standard worldwide because of its dependable performance. Sure Grip Handle - Made of tough, high-impact plastic, the sure grip handle is designed to reduce hand and arm fatigue. Heavy-Duty Spring Action - The heavy-duty stainless steel spring allows for ease of operation and long-lasting durability. 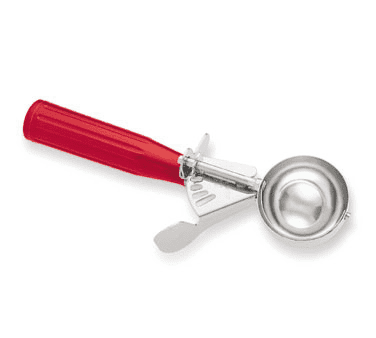 Stainless Steel Bowl - Created for extended durability and long disher life, the disher bowl is made of the highest quality stainless steel to resist corrosion. Color-Coded Handles - Designed for instant identification and improved service, the color-coded handles let you streamline your foodservice operation. Bright, identifiable colors help maintain portion control, and make disher size selection quick and easy.